India reiterates the importance of freedom of navigation and overflight on the high seas and unimpeded lawful commerce, Minister of State for External Affairs MJ Akbar said. MJ Akbar called for making the Indian Ocean a free and secure pathway for global trade. United Nations: Seas cannot be turned into "zones of contention", India has said as it reiterated the importance of freedom of navigation on the high seas and resolving maritime disputes by peaceful means, amid China's assertiveness in the South China Sea. "The rapid and sustained economic growth across oceans is proof that the world's economic engines are purring to a new tune in the 21st century. 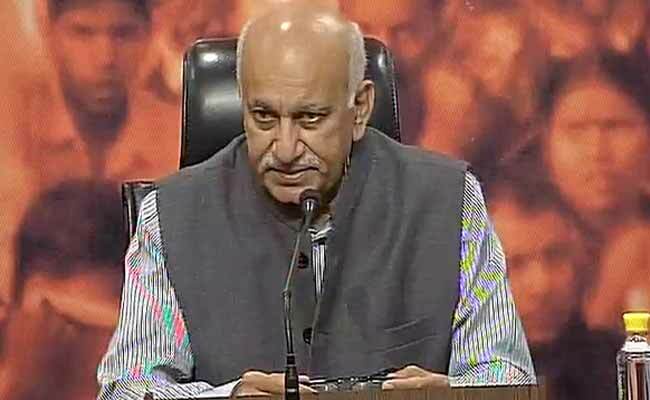 We must turn this into the harmony of a great choir, where each of us is an equal voice," Minister of State for External Affairs MJ Akbar said yesterday, addressing the UN Ocean Conference in the General Assembly here. The Ocean Conference, which opened at the UN headquarters on June 5 and will wrap up today, is the first such summit convened by the UN. The conference focuses on the targets outlined in the 2030 Agenda for Sustainable Development, adopted by Governments in 2015. It aims to presents a platform for the world to reverse pollution of the oceans and seas with concrete solutions. Addressing the conference on World Oceans Day, Mr Akbar said the 21st century will be shaped by the principles of "equality and sovereignty" and those who believe in discord have no place in a choir. "The nations of oceans are often called small. We do not believe in small or big: every nation is sovereign. Capacities might vary, but all nations have equal rights," he said. He emphasised that seas cannot be turned into zones of contention, adding that secure and open sea lanes are critical for peace, stability, prosperity and development. "We cannot allow our seas to turn into zones of contention. An age of shared prosperity demands cooperation... In this context, India reiterates the importance of freedom of navigation and overflight on the high seas, unimpeded lawful commerce, as well as resolving maritime disputes by peaceful means," Mr Akbar said. His comments came amid China's growing assertiveness in the South China Sea. China claims almost all the South China Sea. India has over 7,500 kilometres of coast, and more than a thousand islands with over a third of Indians living along the coast. Mr Akbar said India is aware of the challenges and opportunities that oceans represent, from sustainable fisheries to prevention and control of marine litter and plastic pollution. He warned against the negative impact of overfishing, habitat destruction, pollution and climate change, adding the time for action is "already long overdue". Mr Akbar said fishermen deserve to be at the core of any action plan arrived at in global summits such as the Ocean Conference. "We must devise actionable means to improve their lives; to minimise the conflicts that arise from competition, and, most of all, end the exploitation that is often their fate. Our rules, regulations and laws must serve the impoverished first," he said. Mr Akbar cited the Sagarmala project launched last November in India that focuses on port modernisation, connectivity and coastal community development involving more than 400 projects over the next two decades. He said India continues to expand its development partnership, especially with Small Island Developing States or SIDS. India has committed $500 million as grant-in-aid and a billion dollars in soft loans for SIDS partners over the next three years. "India also believes that there cannot be sustainable development without sustainable engagement among nations. The framework for such sustainable engagement needs to be reinforced," Mr Akbar said.